Justice League #21 is entirely devoted towards Shazam, wrapping up the origin story for Billy Batson in the New 52 Universe. There is little I can say about this issue without spoiling it - and one of the biggest surprises in recent memory. Suffice it to say my attitude towards this revamp has done a 180 and I would gladly buy a monthly Shazam series if Geoff Johns and Gary Frank were the creative team. What prompted this change? Oddly enough, it was a combination of one inspiring moment in this book and my thoughts on the Man of Steel movie and what characters mean to different people. I had always associated the character of Captain Marvel and Billy Batson with the honesty and innocence seen in stories such as Kingdom Come and the Clash episode of Justice League Unlimited. 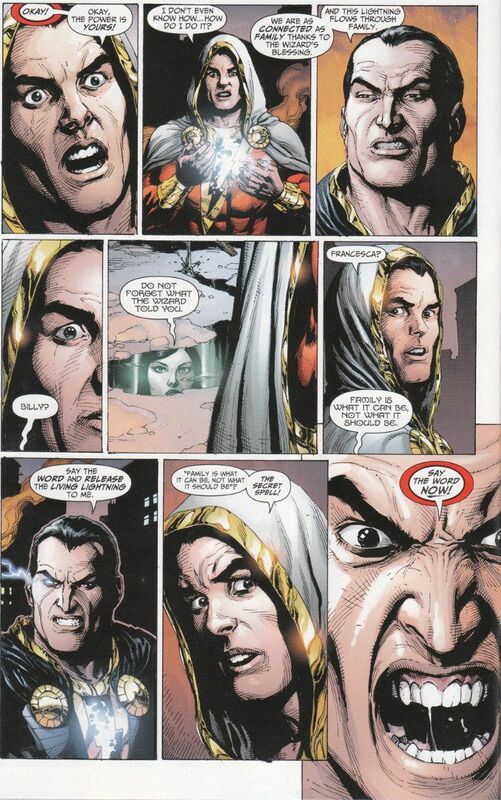 Yet on reflection, I found that all of the appearances of Billy Batson in the comics that I liked (chief among them Geoff Johns' JSA) depicted a character who was idealistic despite lacking any illusions of the world being a fair place! Looking at this issue, I realized that the defining characteristic of Billy Batson isn't innocence - it's optimism. And there's a world of difference between the two. Likewise, Billy's role is not that of the wide-eyed innocent. He is the dream come true of every little guy held down by someone bigger. He is every person who was ever bullied and wished, if only for a second, that they could turn the tables. Curious then that so many of his enemies (indeed, all but one in this story) are victims of bullying who ally themselves against Billy due to their jealousy of what he is. Dr. Sivana is a geeky scientist who longs for the magical power Billy inherited. 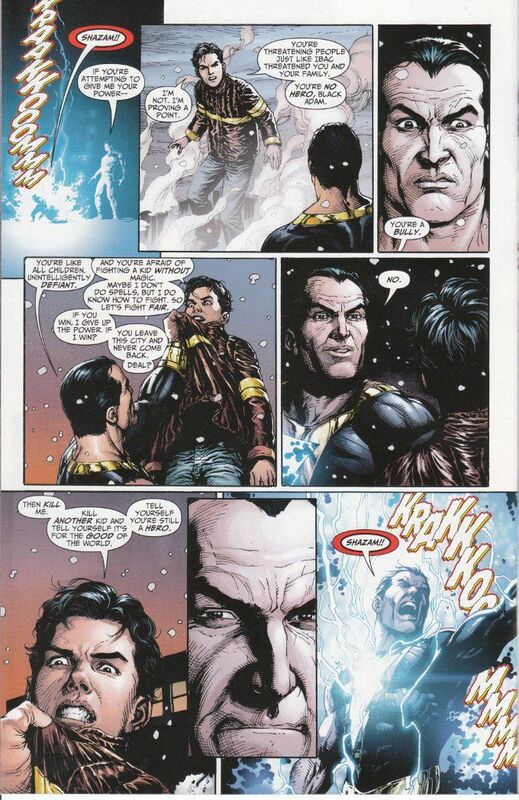 Black Adam is an ex-slave who fears losing what power he has now that Billy has replaced him as a magical champion. Even Mister Mind is a victim of size-discrimination in a way. I think now that restraining this story as the back-up to Justice League hampered it unfairly. Given an entire issue to shine, it does just that. The artwork is as amazing as one would expect from Gary Frank. Geoff Johns' script inspires and entertains. Hopefully the whole story will be collected in one volume by itself without The Justice League getting in the way.